On the Tenth day of the Pro Kabaddi League season 6, the day’s first match: Bengaluru Bulls vs Tamil Thalaivas. Tamil Thalaivas is on the last number of the table on zone B, as they lost four matches and won only one match. Tamil Thalaivas struggle with their poor performance in this season. Bengaluru Bulls win their first match and this was the second match for them. 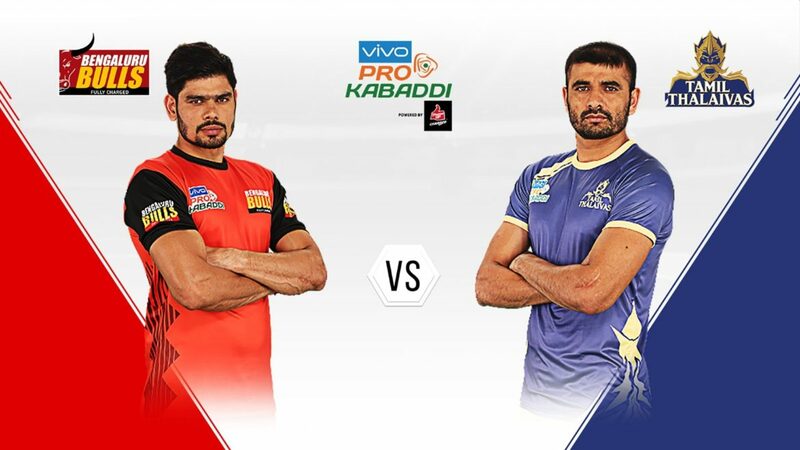 Tamil Thalaivas won the toss and selected choice of court. Bengaluru’s Kashiling scored 4 points on his first raid and in only four minutes score on table 4-1. Again, Kashiling’s successful raid and Tamil Thalaivas all out on 8th minute with score 9-2 on the table. Again, Kashiling successful raid and Tamil Thalaivas all out the second time with the 20-7 score on the table. At halftime, Bengaluru Bulls lead by 9 points 25-14 against Tamil Thalaivas. Kashi failed to take a touch point and with these Bengaluru Bulls all out 29-20. Bengaluru Bulls managed to achieve halftime 9 points lead to winning 9-point lead with score 44-35 on the table. Bengaluru Bulls won the match against Tamil Thalaivas as this was the 5th match in a lost side and Bengaluru won their second match. Haryana Steelers have the same situation as Tamil Thalaivas, four lost the match and one win. While U Mumba had one Tie and two wins. So U Mumba plays without any pressure. Haryana Steelers won the toss and selected choice of court. Haryana Steelers all out at score 13-19 only after the 17-minute game. At Halftime U Mumba Lead with 9 points and score on the table 13-24. U Mumba easily converted halftime 9 points lead to 10-point lead at end of the game with score 32-42 on the table. This was the third win of U Mumba and the fifth loose of Haryana Steelers. You will be shocked to learn how much pocket money the Ambanis gave their children!